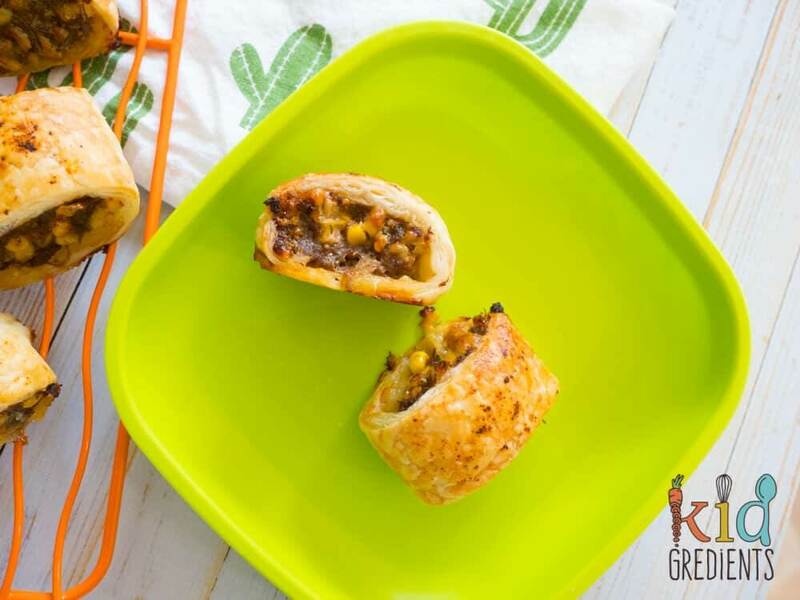 When it comes to kid friendly party food, you can’t go past a sausage roll. Sure, they aren’t the healthiest of foods, but they are an awesome party food, and this Mexican version is packed with flavour. 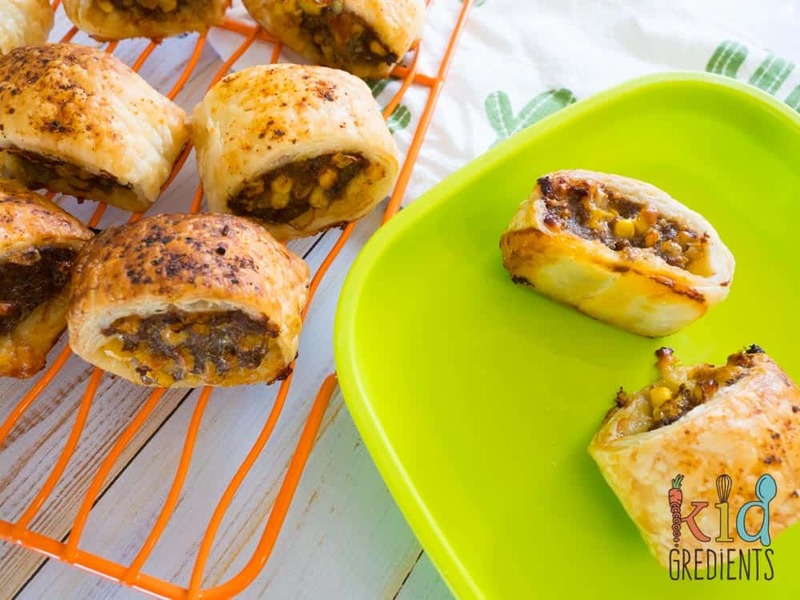 So here goes, Mexican beef sausage rolls need to be on your next party platter. I know, I’m not Mexican. But the flavours in these are Mexican- and my kids love all things evenly slightly Mexican flavoured. I have been to Mexico, I was 12 I don’t remember much of the trip except that I wasn’t allowed to drink the pool water. And that my parents got drunk on margaritas. Oh and I bought Guatemalan worry dolls. And ate filet mignon. Nothing Mexican was part of my Mexican trip. 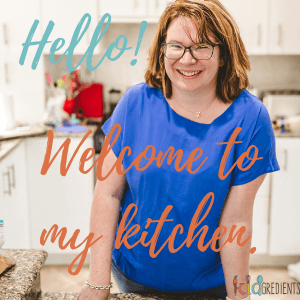 My kids are adventurous with food, but they also like their staples, you know, the things that they love and that they are safe with. If I mention tacos, Mexican or cheese, they are always on board. 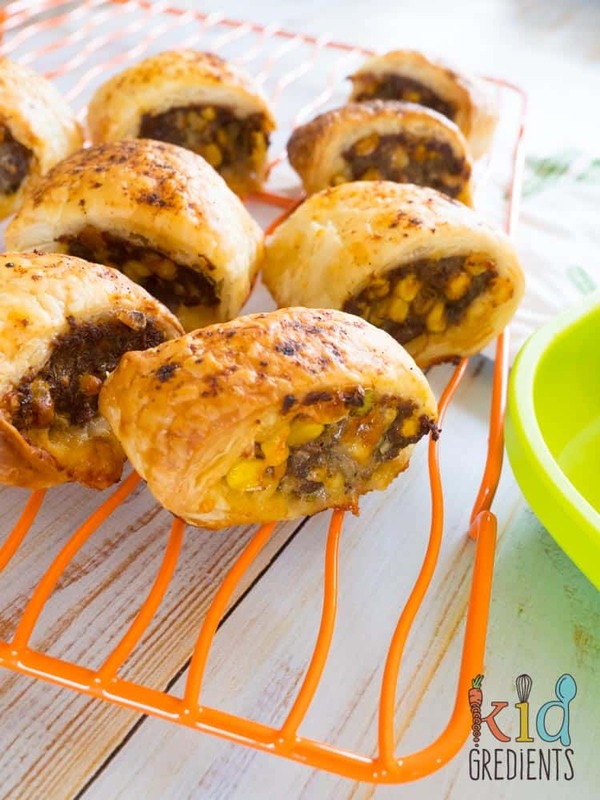 So these sausage rolls, despite being unusual are totally within their safe spectrum of foods. There’s not much to not like about anything wrapped in pastry. 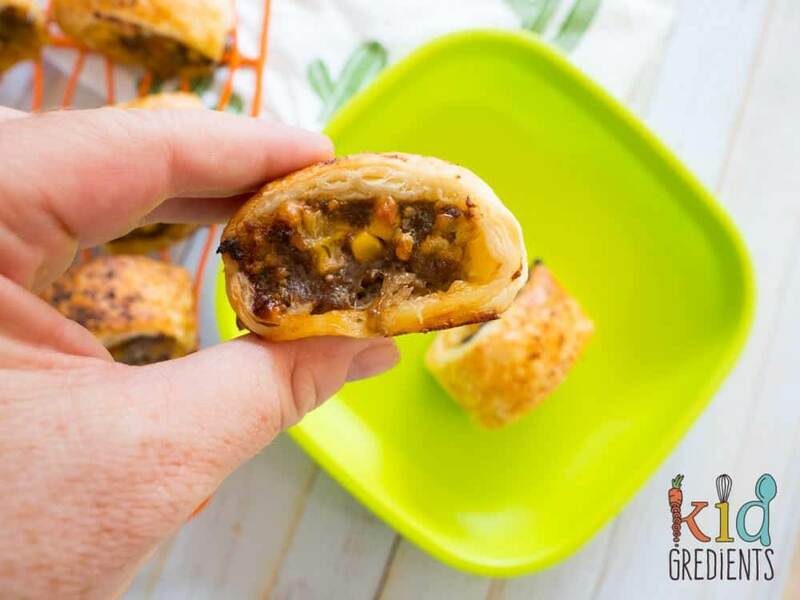 There are two other sausage roll recipes on the blog, the original (healthy beef sausage rolls) one that has been super popular and the more recent one, pork and apple sausage rolls. 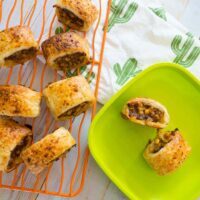 If you’re making Mexican beef sausage rolls, you can either buy the taco seasoning, or you can use this recipe to make your own. Serve them as they are, or with some sour cream for dipping and fresh salsa. 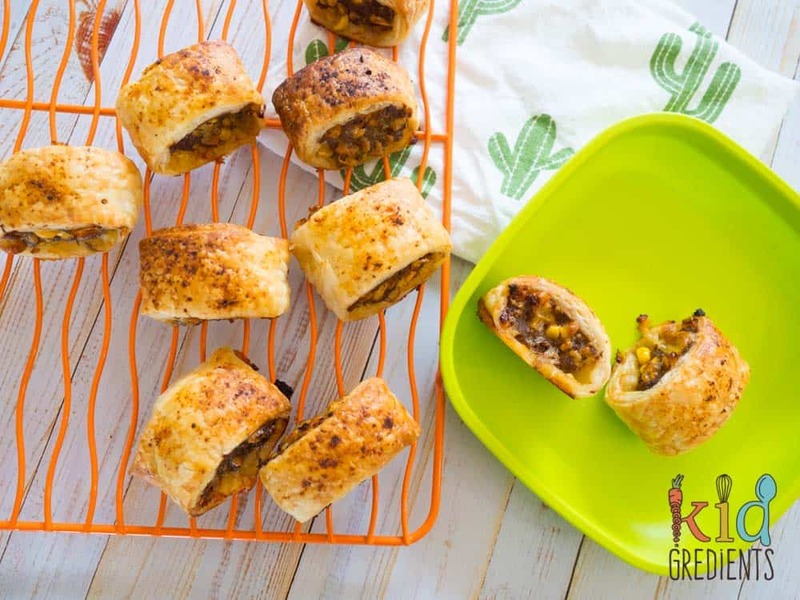 These mexican sausage rolls, made with beef veggies and taco seasoning are delicious and perfect for a party! Take out the pastry and allow to defrost. Combine all of the ingredients except the milk and extra taco seasoning in a bowl. Divide in three and shape into logs. Place along the edge of the pastry sheets. Roll the pastry up into a large log. Cut each log into 8 rounds. Brush with milk and sprinkle taco seasoning on top. To freeze, put on a tray before baking and freeze until solid. Then transfer to freezer bags or containers. Previous Post: « Thai turkey curry meatballs with sweet potato noodles, gluten and dairy free!